Some travelers remember a destination as much for the stunning chocolate cake they consumed as for the breathtaking views and historic attractions. These culinary explorers seek out the best local sweets or linger in side-street bakeries in foreign cities. The highlight of a day abroad could very well be what was eaten after dinner rather than what occurred before the meal. If you have a sweet tooth and wanderlust but no direction, you can get started on your culinary travels with eight great destinations for dessert. These cities in North America and Europe are guaranteed to provide you with amazing sugary experiences and many opportunities for chocolaty souvenir purchases. Chocolate crepes. Eclairs. Profiteroles. Fruit tarts. Croissants. You name it, you can find it in Paris. “It’s perhaps the number one destination in the world for chocolate-lovers,” says David Lebovitz, pastry chef, chocolate expert, and the author of The Great Book of Chocolate. For travelers, the Victoria Palace Hotel occasionally offers chocolate-themed packages. A recent “Easter Chocolate Adventure” package for the month of April included accommodations, breakfast, and coupons for 30 euros worth of chocolate at famous chocolatiers such as La Maison du Chocolat, Jadis et Gourmande, Richart, Jean-Charles Rochoux, Patrick Roger, and Jean-Paul Hevin. Currently, there are 1,263 bakeries in the City of Light, so you won’t have to walk far in any neighborhood to find a tempting snack. “Bakeries owned by Alsatians are terrific,” reveals Lebovitz. One of his favorites is Vandermeersch in the 12th arrondissement. Or, if you prefer chocolate to baked goods, plan a visit to the Left Bank. This area of the city has several quality chocolate shops in close proximity, so you can walk off the calories from one snack as you head toward the next. Lebovitz also recommends the Arnaud Larher pastry shop in Montmartre and l’Etoile d’Or chocolate shop in the ninth arrondissement. For a cultural experience, line up for ice cream at Berthillon on the Ile St. Louis. The Parisians approach the serious decision of which flavor to choose with much discussion and debate. Kids especially will enjoy the chocolate fountain at Le Fontaine de Chocolat. Or, you can join Lebovitz on one of his guided chocolate tours through the city. The walk includes visits to a wide range of chocolatiers and even a chocolate sculptor. In the fall, the huge Salon du Chocolate attracts chocolate companies and artisans from around the world. Switzerland is so famous for its chocolate that even culinary experts have trouble picking the best Swiss city for chocolate lovers. You can find wonderful chocolates throughout the country, but one must-see stop on your culinary tour should be Zurich. Zurich is the home of Sprungli chocolates, which is why Nick Malgieri, pastry chef and cookbook author, chooses the city as his top chocolate destination. “Sprungli is the top name in chocolate in Switzerland,” he says, but Americans may be more familiar with the company’s Lindt chocolates. The flagship Sprungli store is right in the heart of the city and the factory is 10 minutes away in Kilchberg. You can’t tour the factory, but you should certainly visit the store. You can purchase souvenirs in the downstairs store or find immediate gratification at the upstairs cafe. Malgieri says luxemburgerli—cream-filled almond macaroons—are local favorites. “People go nuts for that kind of stuff,” laughs Malgieri. For “very fancy, artesianally made” chocolates, visitors should stop at Cafe Schober, which is now owned by Teuscher Chocolates. Or if you want to see how more mainstream Swiss chocolate bars are made, you can take the train to the Maestrani chocolate factory. If you want to expand your chocolate travels to the rest of Switzerland, you might want to make Geneva your second stop, as the city has a number of chocolate shops. From Montreux, you can take the Chocolate Train to the Cailler-Nestle factory for a tour and tasting. Brussels and Bruges are duking it out for the title of Belgium’s most chocolaty city. Brussels is the long-established favorite with plenty of chocolate shops and the Museum of Cocoa and Chocolate. Bruges is the underdog, staking its challenge with its own museum, Choco-Story, and Choco-Late—a new chocolate festival. Luckily, the two cities are close enough that you can hit both in one trip. In Brussels, the Museum of Cocoa and Chocolate describes the history and production of chocolate. Almost every day, visitors can watch demonstrations of chocolate being made and sample the results. If your curiosity still isn’t sated, you can get factory tours at Le Chocolatier Manon. Or head to Planete Chocolat, where you can attend chocolate-making demos on Saturdays, check out the small museum, or take the Chocolate Tour. Once you’ve learned all you can, you can relax and indulge in some chocolate treats at the shop’s Tasting Salon. Bruges is a city with lots of medieval charm and quite a bit of chocolate, as well. Choco-Story is its chocolate museum with informative displays, a library of books on chocolate, and kid-friendly activities. This year, the museum hosted the first-ever Belgian chocolate festival called Choco-Late in late April and early May. 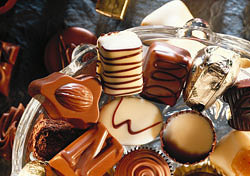 The public fair included visits to the museum and several chocolate ateliers, as well as an exhibition on cocoa drinks. Live demonstrations, tastings, a kids’ corner, chocolate art-making, and information about fair-trade chocolate rounded out the event. Chocolate lovers should keep an eye out for next year’s festivities. Time for some retail therapy? You can stop into stores selling Neuhaus, Godiva, Leonidas, Pierre Marcolini, and Wittamer chocolates. Most of the shops are in Brussels, but Bruges will provide you with plenty of chocolate purchasing opportunities. Hershey is a town that grew up around chocolate and thus is the ultimate chocolate destination in the U.S. Though Hershey has aspects of a chocolate Disneyland, adults will find that they can indulge more mature chocolate tastebuds as well. Hershey’s Chocolate World is definitely aimed at kids, but anyone can enjoy the experience. You’ll find a 3-D movie, a trolley tour, and a ride that takes you through a simulated chocolate factory. Plus, Hersheypark is the ultimate chocolate amusement park. This year’s new ride is the Reese’s Xtreme Cup Challenge, which pits riders against each other as they shoot “laser blasters” at targets to earn points for Team Chocolate or Team Peanut Butter. The winning teams receive samples of Reese’s products. Adults can head to the Hotel Hershey for four-star accommodations and, of course, the spa. Visitors can indulge in chocolate treatments such as a whipped cocoa bath (involving real cocoa), a chocolate fondue wrap, and a chocolate sugar scrub. More traditional spa services are available as well. After you’ve been pampered, nearby Hershey Gardens has beautiful plants and flowers, as well as a butterfly garden. February is the best month to visit Hershey because it’s Chocolate-Covered February. Over 117 special activities take place throughout the month, including beer/wine and chocolate pairings, chocolate craftsmaking, and scavenger hunts. The kickoff event is a Chocolate Dinner Extraordinaire. Plus, as next year is the 100th anniversary of the Hershey Kiss and the 150th birthday of Milton Hershey, look out for even more special events throughout the year. Even gelato experts can’t agree where Italy’s hub of gelato is. Rome and Florence are chockablock with gelaterias, but if you’re looking for the best gelato in the country, you should head for Bologna and La Sorbetteria. Whether you’re at Giolitti in Rome or Vivoli in Florence (runners-up for the best gelato award), or any other vendor, you can use a few tests to make sure you’re getting the good stuff. McGarry says he checks the color of the banana gelato. “If it’s bright yellow, then it’s fake,” he says, “but if it’s grayish, then you know they’re using real bananas.” You can assume that the other flavors are equally canned or real. The gelato is better when kept in metal bins rather than plastic containers, and if you see a sign for “fatta in casa,” you’ll know the gelato was made on the premises. And if you want to order gelato like an Italian? The three most popular flavors are pistachio, noccio (hazelnut), and amarena (wild cherry). Move over Rice-A-Roni; chocolate is the true San Francisco treat. On either side of the Bay, chocolate lovers can learn about, purchase, and taste their favorite sweet. The biggest name in San Francisco chocolate is Ghirardelli. You can find this brand in supermarkets around the country, but its home is Ghirardelli Square in the Fisherman’s Wharf area of the city. The main attraction is the soda fountain and shop, where hungry tourists purchase enormous ice cream sundaes and chocolate bars to take home. Across the square is a cafe that only serves desserts of the baked variety. If you can, plan your visit for September when Ghirardelli holds its chocolate festival. You can purchase books of tickets that you trade for samples of chocolate, dessert, and other treats concocted by Bay Area chefs. You can also watch cooking demos and participate in an ice-cream-sundae eating contest. Youngsters may enjoy the kids’ play area, while adults can imbibe at this year’s new chocolate bar. Across the bay, you’ll find a new star of chocolate: Scharffen Berger. Head to their factory in Berkeley for a free tour. Before you take a peak at the actual working factory, you’ll learn about the history of chocolate, how it’s made, and why Scharffen Berger is unique. Because of the lengthy lectures and the dangers of the machinery, chocolate lovers under the age of 10 should be left at home. If the tour makes you hungry, you can purchase chocolate to take home or snack on chocolate baked goods at the attached cafe. While in San Francisco, you can pick up truffles and other tasty souvenirs at See’s Candies and Joseph Schmidt Confections. And keep an eye out for chocolate-themed hotel packages, especially around Valentine’s Day. The Nob Hill Spa ran a promotion last year for a “Scharffen Berger Chocolate Body Scrub,” while the spa at the Claremont in the Berkeley Hills offers chocolate-themed treatments, such as a Mexican chocolate scrub and a chocolate manicure or pedicure. The ancient Aztecs and Mayans were the first civilizations to cherish the cocoa bean, and their descendents in Oaxaca still prize great chocolate. Not only a dessert food, chocolate comes in all forms in Mexico, such as hot chocolate, mole, and baking chocolate. Mole is a sauce made from chocolate and spices, which is usually served over chicken or pork. Drinking chocolate comes in two kinds: chocolate de agua made with water and chocolate de leche made with milk. Try both to see which you prefer. In Oaxaca, chocolate aficionados should head to Mina Street. The three major chocolatiers—Mayordomo, Guelaguetza, and La Soledad—reside along this sweet avenue. You can watch chocolate being made in a traditional way and treat yourself to a snack or two. Mayordomo gets high marks from travelers, according to Ron Mader, webhost of Planeta.com, and he recommends visiting the Mayordomo bar/chocolate store at the corner of Mina Street and 20 de Noviembre. La Soledad also runs a hotel on Mina Street called Posada Chocolate. Stay here and you’ll have heavenly chocolate dreams all night long. Just off Interstate 89 near Waterbury, Vermont, travelers can find what locals dub “Temptation Alley.” The main draw is the Ben and Jerry’s ice cream factory, but hungry road-trippers will also enjoy the Waterbury Center Chocolatier and Cafe and the Cold Hollow Cider Mill. Ben and Jerry’s runs 30-minute tours of its Waterbury factory almost every day of the year. Tours are a steal at $3 per adults, and kids 12 and under receive free admission. If you want to see live ice-cream making, time your visit for a weekday. You can purchase goodies for now or later at the gift shop and Scoop Shop. One-of-a-kind purchases include factory seconds, pints with too much cookie dough or chocolate chips to be sold in supermarkets. Down the road, the Waterbury Center Chocolatier and Cafe sells the top-of-the-line Lake Champlain Chocolates. You’ll find a large selection of chocolates for purchase, and you can take a break over a mug of hot chocolate at the cafe. The third stop in this area should be the Cold Hollow Cider Mill, which allows visitors to watch cider being made the old-fashioned way. But the real attraction for dessert lovers is The Donut Counter, which sells the mill’s highly-regarded cider donuts. If donuts aren’t your thing, you can choose from other baked goods (all made from natural ingredients) including apple pies, pumpkin rolls, maple cream cheese pockets, and apple-cheddar squares. Also, be on the lookout for Vermont’s soft-serve ice cream, often in specialty flavors such as maple. You’ll pass for a Vermonter if you ask for a “creemie”—that’s what the locals call this summery dessert.